-Vancouver, BC / TheNewswire / December 4, 2018 - Durango Resources Inc. (TSX.V-DGO), (the "Company" or "Durango") announces that an airborne survey conducted on its wholly owned Trove property in the Windfall Lake Urban Barry area of Quebec has outlined a magnetic anomaly. 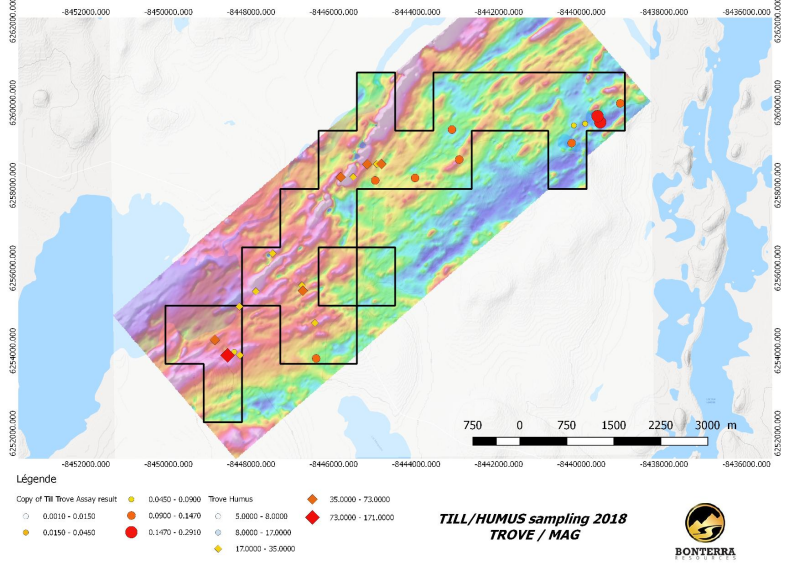 The Trove property is surrounded by Osisko Mining Inc. (TSX.V-OSK) and an airborne survey was completed by Bonterra Resources Inc. (TSX.V-BTR) ("Bonterra") while the property was under option to Bonterra in 2018. The survey shows an anomaly following the regional fault which trends through the property with the dark pink representing a magnetic high and the dark blue representing a magnetic low. Marcy Kiesman, CEO of Durango stated, "We are fortunate to have had Bonterra complete the airborne survey on the Trove property as it has delineated regional fault information and highlighted the northeast structure going through the property. I am very excited that we have retained 100% interest in the Trove property which is part of the emerging Windfall Lake gold mining camp and look forward to exploring it further in the upcoming months."